What is nuYou Labs Garcinia Cambogia Extract? nuYou Labs Garcinia Cambogia Extract is a supplement that aims to suppress the appetite. It also claims to increase serotonin levels, which will increase a customer’s energy levels. This product also claims to help a customer lose stubborn belly fat and decrease cortisol levels. The manufacturer states that this product does not contain any additives or fillers. nuYou Labs suggests taking two Garcinia Cambogia Extract capsules a day. There are no indications of whether these capsules should be taken with a meal or before and if they should be taken at the same time or not. It appears that nuYou Labs Garcinia Cambogia extract is not sold directly from the manufacturer’s website. The customer is redirected to the Amazon product page from the manufacturer’s website. On Amazon, under where the price usually is, it says that it is currently unavailable. This is strange that there is no price listed neither on the manufacturer’s website nor the Amazon product site. If a customer wants the price, it says to email the third-party Amazon seller. nuYou Labs states that the customer should not take this more than the recommended dose. The label is also very clear that a doctor should be consulted if the potential customer is pregnant or nursing or if the customer is already taking medication for another issue. Children under 18 should also consult medical professionals before consuming this product. While it does not include a separate manufacturer’s commitment, nuYou Labs does include the words 100% Satisfaction Guarantee on the upper right-hand corner of the website. The number to reach the customer service team is listed directly below that claim. We think the lack of transparency for a return and refund policy is potentially confusing to the customer. There are no reviews on the manufacturer’s website. There are 43 reviews on Amazon. Overall, nuYou Labs Garcinia Cambogia received 3 out of 5 stars. There were equal numbers of positive and negative reviews. On the positive side, reviewers stated that it helped in weight loss and appetite suppression. On the negative side, this product did not work at all for customers. They claimed it was a waste of money. 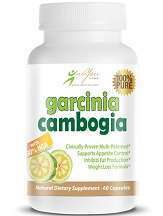 nuYou Labs Garcinia Cambogia extract seems to satisfy a few people who reviewed it on Amazon. It does seem to suppress appetite and help with weight management for some customers. There are a few things the customer should consider as red flags before they make their final purchase. One thing that is concerning is the lack of clarity around the manufacturer’s guarantee. It is a mere short phrase on the top of the website and a customer service phone number. There is no formal explanation of a return and refund process. This could be time-consuming and frustrating to a customer. The volume of negative reviews is also concerning. You may be better off looking at some other more effective Garcinia Cambogia products on the market.